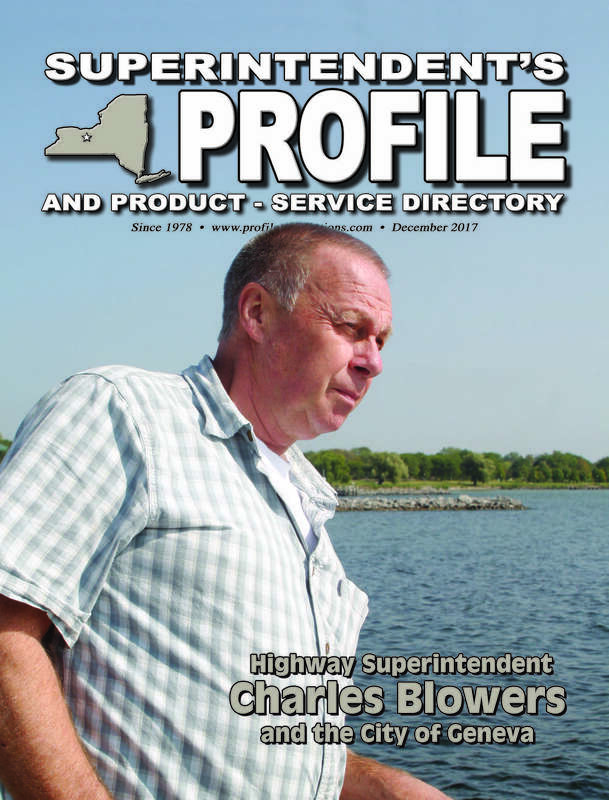 Charles Blowers, highway superintendent of the city of Geneva, is not a big water sport person, and yet his relationship to Seneca Lake — which borders the city for miles — is central to his sense of well-being here, where he grew up. Seneca Lake, expansive and serene, is what makes Geneva special and not just another city in upstate someplace. Residents feel centered by the lake. Seneca Lake and the city of Geneva are also the trout capital of the world. As early as the late 1700s, when the community first got started, the founders restricted any building on the east side of what was then a frontier settlement, because it would block the vista of the water. The city generally grew up on the hill, with an often-open sideline to the water. The view is largely unobstructed by any commercial development right by the water, so the founders seem to have gotten their wish. The city's highway department maintains 45 lane miles, including 20 miles for the state. The 2017 budget for highway is $919,027 and for sewers is $630,626. Furthermore, CHIPS is responsible for $275,205, while Pave NY contributes $62,818, and EWR pays $41,324 for roads. Charles leads a crew of 15 workers who do both highway and sewers. He is appointed and reports to Mark Perry, director of engineering/public works. Their working relationship is often done using a dedicated Internet site. Every day, 24x7, they keep one another in the loop. Because Charles and Mark work together so closely, Superintendent's Profile asked Mark why he appointed Charles to the top job in highways and sewers. The city department has two full-time, dedicated mechanics. 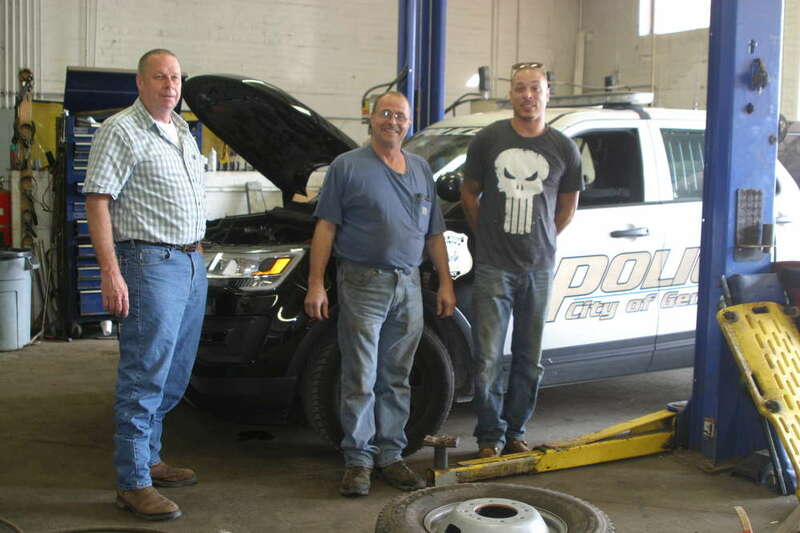 They also repair police cars and therefore are a fountain of knowledge about the Crown Vic. Tightening the symbiotic relationship between Geneva and Seneca Lake is becoming even more apparent. Charles and his 15-person crew are involved in an extensive plan to make Geneva more “walkable and bike friendly.” So, in addition to routine plowing, road repair, brush and debris pickup, and working with city sewer issues, the crew will be developing and maintaining pedestrian-friendly ways of getting around the city. Because Geneva is a college town, road surfaces also have to be skateboard-friendly, as skateboards are a popular mode of carbon-free locomotion on campus. Communication between Charles and Mark, nearly 24x7, takes place with a system called Click Fix. For example, when a piece of textured sidewalk plate was reported broken, ClickFix carried the message from Mark to Charles without phone calls, text, or facetime. Charles went to work on it. Mark said his only fault with Charles's work ethic is that Charles repairs things immediately and then sometimes forgets to let him know it's all taken care of. On his end, Charles takes all of the 911 calls that are directed to his departments. For example, he gets calls of trees in the road, or traffic signals on the blink, sewer issues, and roads flooded about three to four times a week. Because these calls come in any time and any day, this part of his job does intrude on his life at times. “You are never really relaxed about it,” he said. Again, ClickFix keeps Mark in the loop seamlessly on 911 calls in a city where a lot is always going on. 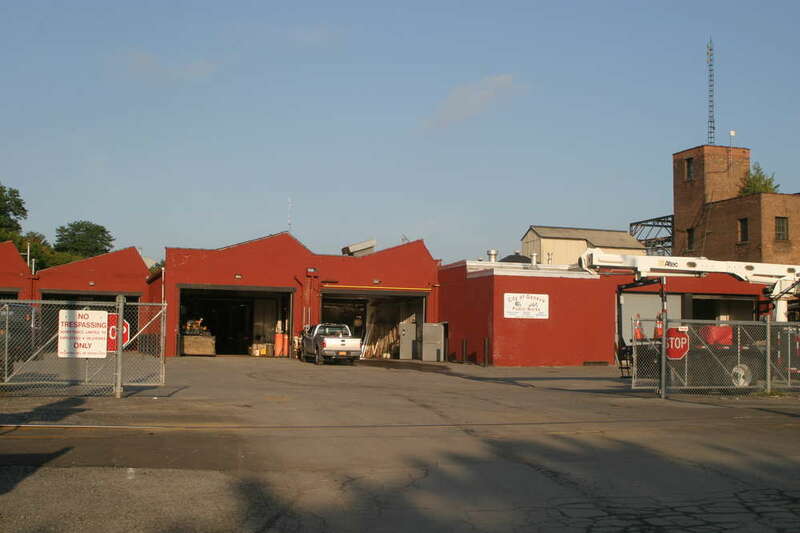 The city of Geneva’s highway garage is in a former factory where metal cans were made. An active freight line is just yards from the front door. How's the Equipment in Geneva? Snowplowing is routine. They still use a wingman because of the density of the population and width of the heavily trafficked roads. They use 2,400 tons of treated salt annually. In addition to two big plows, they use four large pickup trucks to plow and treat the roads. Included in their route is 20 miles of state road — Routes 5 and 20, an iconic, east-west highway. Charles said the level of reimbursement for those miles has not changed in many years, while the cost of doing the work has constantly risen. He said that about 40 years ago the departments he runs today had a total of 35 full-time employees doing the same amount of work. The years of 1990-1991 saw a lot of layoffs through the city, and yet, positions in city highways and sewers are coveted right now. Highway and sewer jobs here seem to be in demand. There is one opening for assistant superintendent that requires applicants to take a civil service exam, which is currently going on. The city manager said 300 people applied for the position, and all of them have a CDL license, which is a prerequisite. (L-R): Co-workers and friends Bruce DiFederico, Chris Thibault, and Tom Baxter. Charles oversees both highway and sewers in this city of close to 14,000 residents. With the exception of the big orange plows, all of the vehicles for both highway and sewers are silver-colored for a unified seamless appearance. Laborers work for both departments. Geneva is home to Hobart and William Smith Colleges. Having a lovely old college central to the city helps maintain the prosperous colonial architecture everywhere. Geneva is located close to the Thruway and along active rail lines. The city has always had a lot of bustle. The large, fully occupied industrial parks appear to be prospering here. And older brick buildings from the 1800s are frequently re-purposed and occupied. In one instance, a promising red brick factory, built in the 1800s with lots of windows, is now a custom-made furniture shop and occasional wedding facility. The city has seeded lots of small businesses and helped them get started in commerce attracted by grant initiatives and low interest loans. Many of the merchants downtown have been there for years. Probably because of the number of college students in the city, Geneva has a decidedly young vibe to it. For a lot of people, in good weather, this is outdoor, car-free living at its best. For example, for the second consecutive summer, one street full of restaurants and bars has been closed to traffic on the weekends, beginning at 5 p.m. Then all the serving tables come onto the street. Sometimes with live music, under the glow of a canopy of LED lights, the scene is both outdoorsy and friendly — kind of like Geneva itself. One participant in the street-closure is a nationally acclaimed restaurant called FLX (for Finger Lakes). The fine dining joint was just named one of the top 10 restaurants in the United States this year. It's not too surprising that such a gastronomic success story is taking place here in Geneva. Coincidentally — and back to the highway story — Linden Street, a participant in this innovation of al fresco downtown dining, has also been dug up and had its sewer and water pipes enlarged and replaced. Charles gives another example of the depth of the problems caused by aging infrastructure beneath ground. “In one road, two miles of 20-inch pipes were replaced,” he said. How did they know there was big problem? “There was water running in the streets,” he said. The sewer part of Charles's job is actually more high-tech than you might expect. Rather than digging up a street to go after an obstruction, Charles frequently calls on Green Mountain Pipeline Services, a Vermont-based operation with a few tried and true solutions for trenchless manhole rehabilitation. The company does something called sliplining on the problem pipes. Thanks to CCTV — cameras and a closed video system — workers can determine where they need to dig before firing up the jackhammer. Interestingly, it's an infusion of high-end cleaning and personal care products that are plugging up the works, so to speak. He said when a problem is reported, his crew determines whether the problem is within the home or in the city's sewer line. Either way, somebody is going to have to pay for it. Water pipes also break quite a bit because Charles said most of them are about 110 years old. The crew for both highways and sewers are: Charles Blowers; Mike Karweck (street sewer maintenance); Carl Meens, HEO; Frank Quartaro, HEO; Tom Baxter, MEO; Mike George, MEO, Frank Pane Jr, MEO; Daryl Soscia, MEO; Vaughn Neison, MEO; Steve Parker, laborer; and Bruce DiFrederico and Joe Osterhout, mechanics. Thanks to a recent infusion of $10 million pledged by Gov. Andrew Cuomo for specific improvements in the city, Geneva is making far-reaching steps to become more pedestrian friendly and to strengthen the link between downtown and Seneca Lake. The actual work, which will change traffic patterns on the well-traveled Routes 5 and 20, is still in the planning stages. What is known right now for sure is that the now four-lane portion of the highway under consideration will be reduced to two lanes on each side of a mid-way point-like bunker, at a place critical to ensuring safe pedestrian crossings to and from the lake. Once drivers are past the vista, the original configuration of lanes will renew. The city's Comprehensive Plan, adopted in 2016, identifies five key elements as they move forward. Their stated goals are to be: Beautiful, Prosperous, Equitable, Connected, and Sustainable. The pedestrian part of reaching Seneca Lake will take a $2.2 million chunk from the $10 million grant. Seneca Lake, the largest of the Finger Lakes, is about 34 miles long and more than 60 feet deep in places. Watkins Glen occupies the other end. Unlike many lakeside places, Geneva has only one hotel on the water and no restaurants, marinas, or bars. Without such commercialization, the lake remains serene and inviting. However, plans for that quietude are also changing. The city has installed miles of wide concrete swaths along the lake edge for pleasant walks. A Geneva tourist booth has been taken over by the state and is morphing into a “Welcome to the Finger Lakes” center, projecting a bigger picture. That building is under construction. Currently, there is a refreshing lack of commercialization competing with nature for our attention. Just one hotel and an ice cream stand. Still to come is an anticipated public marina (there is none now). In the city, restoration of the old Patent Cereal Block will add apartments and stores. Geneva has a new brewery, upgrades to the Smith Opera House are taking place, and free broadband access is available throughout downtown. Intersections will be improved, and an arched gateway “Welcome to Geneva” sign is planned to span Exchange Street. In the surrounding area, several new hotels compete with the traditional old favorites such as Rustbelt Castle (it really is a castle.) Geneva appears to be on a roll. Charles said the new Marriott is reportedly booked every night. At least part of the business renaissance is due to the efforts being made to make Geneva more pedestrian friendly. The city's “Walkability Action Plan,” was drawn up following extensive research, much of it done in person on the streets. The city sits on 4.3 square miles. Some of the resulting recommendations include parklets, sidewalk improvements, increasing overall safety, and fixing gaps within the network. Other ideas address a road diet (reducing the number of lanes) to help “traffic calming.” Just a few popular traffic calming devices are: medians, streetscapes, curb extensions, traffic circles, traffic controls and bike lanes. If you want to check your community's walkability by following a quick check list—go to www.geneva.ny.us. Then search for the Geneva Walkability Action Plan. Charles grew up and was educated in Geneva. His first job was selling International Harvester farm equipment and working as a mechanic. His ability with equipment helped determine the rest of his career path. He still loves to tinker with cars, favoring the models he wished he'd had when he was a young man. He was appointed to the dual position of highway and sewers by supervisor Mark Perry, director of engineering and public works. Geneva has been home to Hobart and William Smith Colleges since the late 1800s. The well-groomed campus is part of the city itself. Benches facing the lake, often under shade trees, are numerous and well used. For the first time in recent history, they are beginning to have a parking problem. Charles said, when compared to other upstate communities, it's a good problem to have. Fraternities and sororities have been good shepherds for the city's own magnificent mansions, the buildings that the groups call home. These large, historically important structures are expensive to preserve and maintain. So when the college asked the city to close a one-way street that is central to their campus in the interest of further protecting student safety, Charles and his team helped put the word “out there” about the proposal. He said the city found that plenty of people who used that street were unwilling to see the college take it over. A compromise was reached when the city had Charles install sophisticated speed bumps — actually several of them. Horrible, hard to drive over easily, the bump-outs (what Charles calls them) do help slow traffic — but don't get rid of cars altogether. Charles said that because the project was in the best interests of the college, the school also shouldered half the cost. “They are raised crosswalks,” said Charles, describing the solution as he watched a young skateboarder expertly ride the bump-outs on her way to class. Slowing traffic down is key in a neighborhood where throngs of young people are glued to their devices, sometimes on a skateboard. Costs associated with the project are interesting because the college, a non-profit, also had put bids out on the job. He said the college got a compromise, but the people who didn't want any changes didn't get what they wanted, either. Mick Jagger once sang a truism, “You can't always get what you want,” and that would be true of the city of Geneva's highway garage. While completely serviceable and utilitarian, the structure is about as welcoming as a minimum-security prison's waiting room. The crew sometimes calls it the Taj Mahal. The garage is only a few yards away from an active train line. Of the rushing rattle of graffiti-covered box cars, one worker said that you don't even notice them after a while. The city was desperate for a suitable facility, and an old American Can Company manufacturing plant was up for sale. The company once made heavy equipment that made cans. American Can had constructed the then-new plant attached to the side of an older frame company building that now looks like it is about to fall down. That part is abandoned. Charles and his crew are headquartered in the newer, concrete factory/highway garage. The clapboard building is now empty. Inside, the long barren hallways prevent any sense of teamwork or camaraderie, except in the break room. In the garage, there's a constant parade of police vehicles. One mechanic said they have also been asked to melt down guns confiscated by the police, who once even stored evidence in a special locked area in the old clapboard structure. Times have changed. For Charles, his territory is the asphalt and the sewers. The site further explains their direction with repairs. First, pavement condition; the extent and cause of surface problems. Second, subsurface utilities. Beneath most city roads, the city maintains a network of water, sewer and stormwater pipes. The third consideration on choosing which roads get repaired first is the road's impact on the overall transportation network. Also key are the routes vital to public safety and schools. Types of repairs include a quick fix or patch for temporary repairs. When the deterioration goes beyond occasional, the city will grind off an inch or two of asphalt and apply a new coat for a road whose life cycle is about seven to 10 years. When the city knows there is some damage to utilities underneath, resurfacing alone doesn't make fiscal sense. In these cases, rehabilitation is called for — after a demo to the surface, utility repairs are done. If the curbs are in poor condition and budgets permit, they are replaced. These repairs should last between 10 to 15 years. When the road is really bad, the ultimate game plan is for a total, top to bottom, reconstruction. This encompasses all new underground utilities, curbs and sidewalks. New construction has a life expectancy of more than 30 years. The city also has a tree committee that actively engages neighbors in the care and feeding of replacement trees. He has two daughters from a previous marriage and some grandchildren, so he has no intention of moving away year-round. His partner of 22 years, who runs a funeral parlor, also has kids in the area. Her parents, in their 90s and healthy, recently moved into the couple's home. “We have plenty of room,” Charles said. He also rebuilt his garage into a kitchen to accommodate his hobby — cooking. “I cook every night,” he said. Bar-B-Que sauce is a specialty, with lot of herbs and spices. Of his ongoing contributions to the city of Geneva, he is pretty modest, but he does take pride in noticing what he thinks is a positive trend — beginning at the asphalt level. Imagine if Massachusetts owned so much land that they didn't know how much of their territory was in what is now upstate New York. That kind of confusion shook the underpinnings of several large land transactions. The key to how citizens tried to take charge is called the pre-emption line. The pre-emption line is a line drawn from the Pennsylvania border due north to mark the boundary between New York and the western land rights of Massachusetts. More doubt about ownership arose as a new pre-emption line was created that would affect where Geneva put down its roots. Plenty of legal descriptions about land referred to the old pre-emption line, still a measurement they could trust. Before all that, the French, English and Dutch all claimed land here. Soldiers who fought with Sullivan were often given large land grants for their efforts. A common soldier might have gotten 500 acres, a major general nearly 6,000 acres. The place was also headquarters for the infamous “Leasee Company,” located “under the hill where the bluff approaches the lake.” Somehow the Leasee operators kept the state from negotiating with the Indians for native land. They also reportedly kept the Seneca plied with alcohol to gain their support. In November 1787, the Leasee Company gained access to all of the Seneca land in the state for a period of 999 years. The following year, 1788, an unfinished bark cabin became the village's first tavern and meeting place. The first white child was born in the settlement then called Kanadesaga, as well as the Old Castle. There is no record of why the name Geneva was eventually chosen. This is where it gets sticky. Most of this part of upstate was acquired as a result of the Phelps and Gorham purchase. Oliver Phelps arrived here on June 2, 1788. He found he could not make a deal with the Indians because a survey revealed that Esplanade, or Geneva, was east of the pre-emption line, hence on the land claimed by the Leasee Company. The second survey, resulting in the new pre-emption line, put Geneva securely in New York State. By this time, Geneva was a village of some note and full of land speculators, explorers and agents and the principal venue for Indian trade. Drawn by reports of incredibly fertile land, early settlers hunkered down then. As early as 1796, the village had its own water company that laid pipes from the White Springs. The pipes were logs, 10 to 12 inches in diameter, with a 2-inch bore through them to supply water to every house in the village. This, at a time when the population was fewer than 400 people, but spirits were high. For example, the sloop “Alexander,” built in Geneva, was launched with much civic pride and fanfare. The steamboat plied the lake with passengers and trade at a time when road travel was tedious. Roads were laid out in 1793. Eighty years later, by March 4, 1873, highways were already being considered vital for momentum here. On that date, officers for Geneva were elected, including Wm. H. Dox, commissioner of highways. Some early people came from Virginia with their slaves. Sheep farms were numerous; a large woolen factory sprang up in White Springs. The Civil War-era cloth sold for $5 to $12 a yard, but after the conflict, prices fell and one of Geneva's earliest success stories lost its glimmer. The village of Geneva was incorporated in 1806 and became a city in 1897. By the early 19th century the city's reputation as a nursery and agricultural community was entrenched. More than 8,000 acres were used to grow flowers, shrubbery, fruit, and ornamental trees. But the eventual opening of water routes to New York City caused that industry to tank because farmers could get their fresh produce and grains directly to their target markets. With the opening of the Erie Canal connecting Albany to Buffalo in 1825, off-the-canal towns like Geneva took a hit.